The thing about living only a short drive from your parents is that when it’s time for a visit, you can just throw your whole closet & kitchen into the car and go. Yeah, I said kitchen. Since I got a KitchenAid stand mixer long before my mom upgraded her 70’s-era JCPenny stand mixer (from their wedding), I’d go so far as to pack up my KitchenAid stand mixer along with about 10 different flours for all our holiday baking (also – how else could we make blackberry basil ice cream?). But really – is it any different than my brother bringing home his skis and boots? My hobbies require proper equipment. Fortunately, my mom finally got herself a KitchenAid stand mixer complete with the ice cream maker attachment this year, so I look a little less ridiculous when I show up for the holidays (stay tuned for your chance to win your own KitchenAid stand mixer and ice cream maker at the bottom of this post). 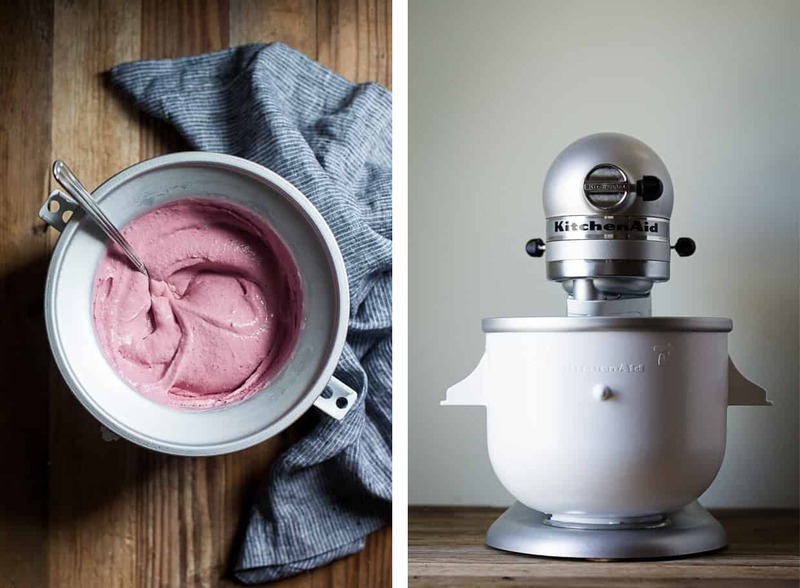 Homemade ice cream is a tradition for every summer gathering in my family – one that involves a vintage wooden ice cream maker, crushed ice with salt, and a loud churning noise that hums as the soundtrack for the party. Many hours later, we’d end up with vanilla “ice cream” that really was more like soft serve than ice cream, and had a distinct non-ice creamy flavor all on its own. For nostalgia’s sake, I loved it, but it definitely wasn’t the creamy scoopable homemade ice cream we make now. For the first family gathering of the summer a couple of weeks ago, my mom finally pulled out her new KitchenAid ice cream maker. She wanted to use up her apricots, so I wrote up a recipe for apricot lavender ice cream. She made that batch and was so into it that she went to town, making two more flavors totally on her own with the same ice cream base. I brought chocolate cupcakes to the party and they were (rightfully) totally upstaged by her trio of summery ice creams. Watch out – my mom might open up an ice cream parlor from her kitchen. If you’ve got a good base, you can throw your choice of flavor profiles on top and trust it’s gonna be good. Lucas: Yeessss! Woah, so creamy. Me: And you can’t even taste the coconut, right? Lucas: Wait – this is vegan?! +10 points for this ice cream. 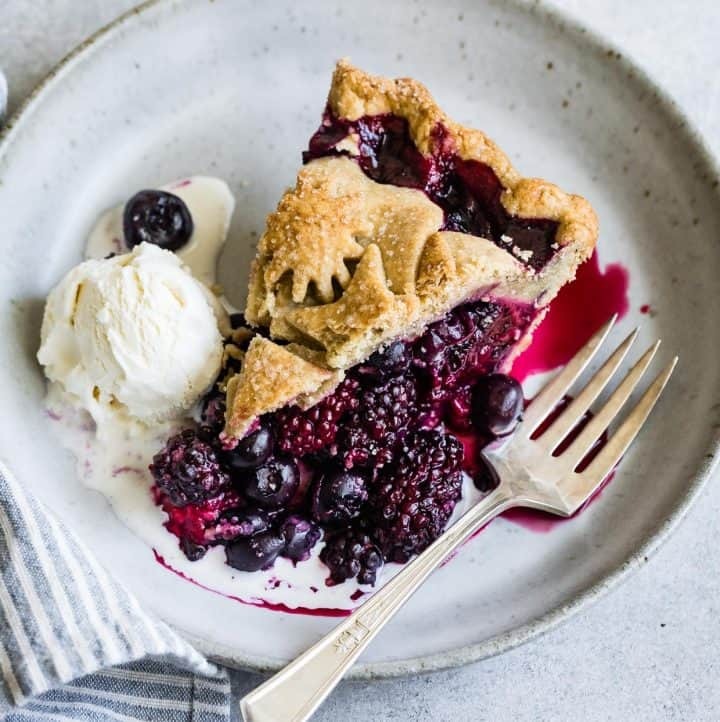 This variation pairs ripe blackberries with a sweet and slightly bitter herby basil hint to offset the sweet summer berries. The basil is infused into the coconut cream and strained, with a few leaves blended in with the blackberries. If you’re like me, you might find yourself eating 6 small scoops for lunch (followed by three cookies from Alanna’s upcoming cookbook). This is my summer diet. 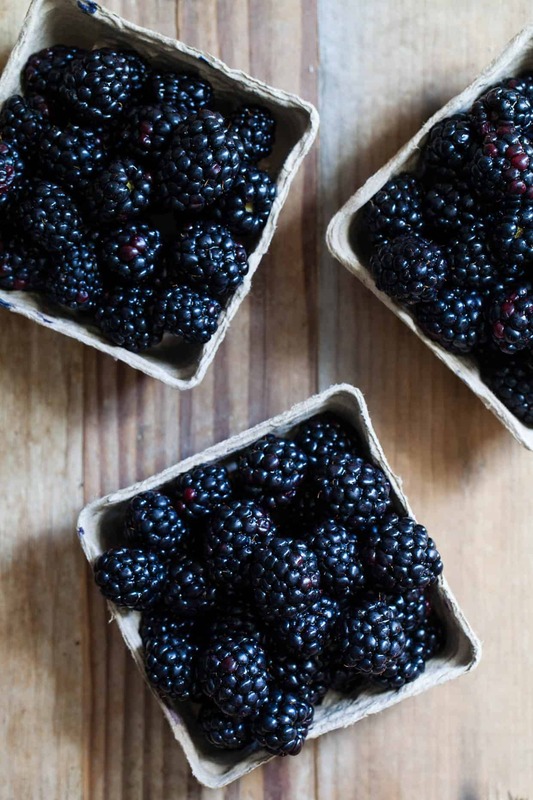 Place the blackberries in a blender and set aside while you infuse the coconut cream with basil. Warm the coconut cream, coconut milk, sugar, basil, corn syrup, and coconut oil in a medium pot over medium heat, stirring occasionally. When the cream begins to simmer, remove the pot from heat. Cover and let the mixture steep for 20 minutes. Strain the mixture, pressing as much liquid out of the basil leaves as possible. Add 1/2 tablespoon of the strained basil to the blender with the blackberries and purée until completely smooth. Pour the cream into the blender with the blackberries and pulse until combined. Pour the puréed mixture into a large 1-gallon Ziploc bag. Seal it and submerge the mixture in the ice bath until cold, about 30 minutes. Pour the blackberry ice cream base into the bowl of your pre-frozen ice cream maker. Follow the directions on your ice cream maker to churn the base into ice cream, until it is the consistency of soft-serve, about 18 minutes. Pack the ice cream into an air-tight storage container or a metal loaf pan, pressing a sheet of parchment paper directly against the ice cream. *You can replace the corn syrup with 2 tablespoons more raw turbinado sugar if you want, but the result will be less creamy. The corn syrup in this recipe makes the ice cream more smooth and less icy. Disclosure: I was not compensated to write this post. 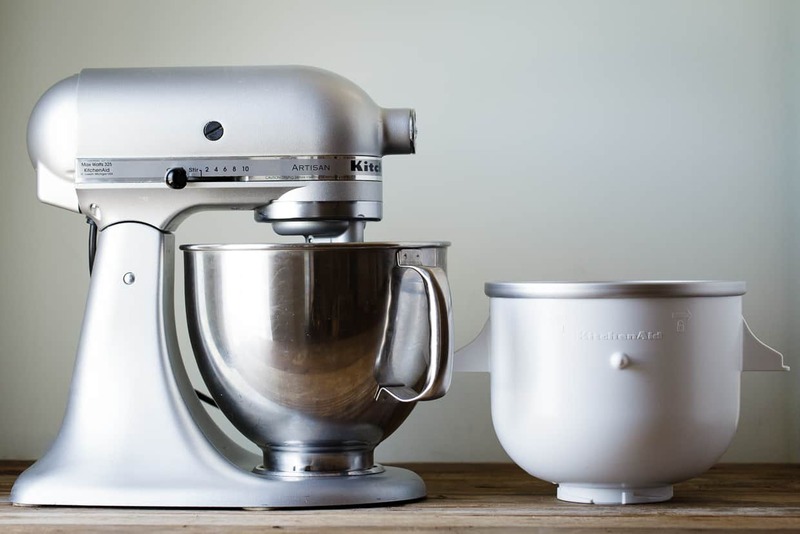 KitchenAid is generously providing the KitchenAid stand mixer and ice cream maker attachment for one reader. As always, the opinions expressed here are solely my own. I’m making the vegan vanilla you made a month or so ago! Also, Lavender and Honey and Chevre. MMMMmmmmm. Raspberry Vanilla Ginger Ice Cream! Oh my goodness. Blueberry cheesecake, or any of them. Yum! Totally jealous you live so close to your parents. I need my Mom to move to California just to help me keep up my laundry haha! :) Sweet giveaway! I’d make a creamy Espresso Chocolate Chip! Alright so by this time already you probably know I’m not a baker. I do try though! Occasionally my patience gets the best of me and I can’t hand-mix my butter and sugar together to create a nice creamy consistency (I filmed it, it might go up, and it might be too embarrassing to publish) but either way man.. I freakin’ try! LOL. Bought my Mom a fancy kitchen-aid mixer for Christmas the year before I moved to the USA – so that was her huge gift before I was like “Okay no more gifts Ma, I’m unemployed… so here’s a nice one for ya”. Now I kinda want one for myself. To make bread. And bagels. Oh and maybe some more cookies… I love cookies. Maybe not ice cream because I’m not that talented yet. Unless I win, then I’ll try. Maybe get that on film. HAHAH. Can you come over and teach me? I’m so bad with written directions, I sometimes skip over them. Verbal is where it’s at. First – ABSOLUTELY beautiful photos! 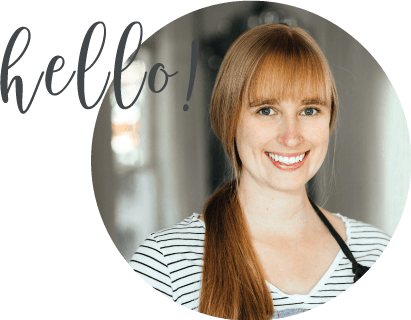 Second, vegan ice cream – does that mean it is healthy and I can eat it everyday ;) Third – AMAZING giveaway! I would make ube ice cream!!!! Also, I made vanilla chai and chocolate peppermint ice cream with Diane (with her ice cream maker) one time (http://best.berkeley.edu/~jen/food.html#vanilla-chai-and-choc-mint-ice-cream). YUM. And one more: I’m really into sorbets and am obsessed with this raspberry sorbet at work. It’s too hot in San Jose- all I want to do is eat ice cream. I’ve been playing around with vegan ice cream bases and this one looks 10x better than my best batch!! What a gorgeous ice cream flavor! I need to try the fruit + basil pairing, been seeing it everywhere lately! You know, I’ve never had cheesecake ice cream!? This giveaway is AMAZING! The ice cream maker attachment is a dream come true! The Mint Canteloupe one sounds interesting! I want to make the Cherry one for my cherry-loving son. I think a sweet corn ice cream sounds amazing! Thanks for such awesome giveaway! black sesame with red bean vegan ice cream….yum! 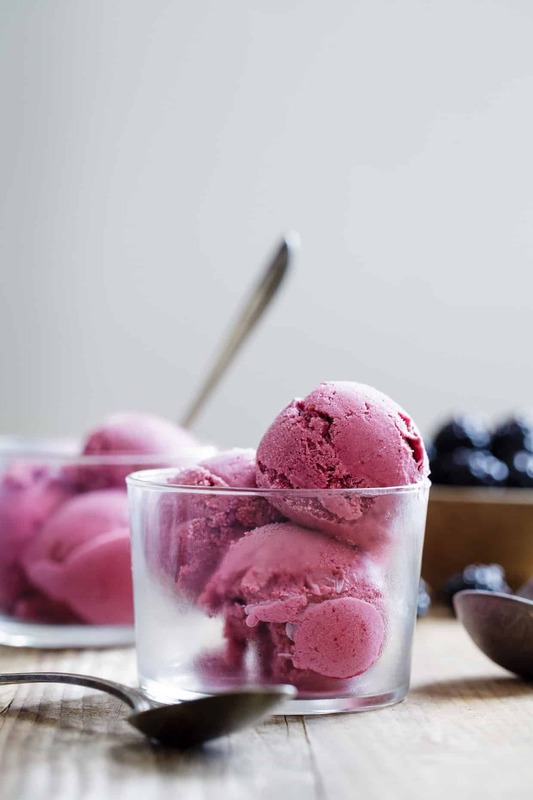 Hmmm….this blackberry basil ice cream recipe may actually get me to try a coconut milk based ice cream. ice cream with avocado lol, that would be so weird! I would make a peach and ginger ice cream! I’d definitely make Balsamic Roasted Strawberry Ice Cream; I’ve made it before and it was delicious. Beautiful recipe The pictures alone make me want to make it right now. Basil in ice cream is one of my favourite things — just yesterday I had a milkshake with some in it (some fancy flavor called “basilic instinct” which also had vodka and citrus.) So clearly I’d make just that : a simple basil flavoured ice cream to enjoy any time of day with that terrible no-good heat wave that’s coming in. What a delicious ice cream. Basil and Blackberry duo sounds incredible. Perfect for the hot and humid of days of the Caribbean summer.. Cheers! 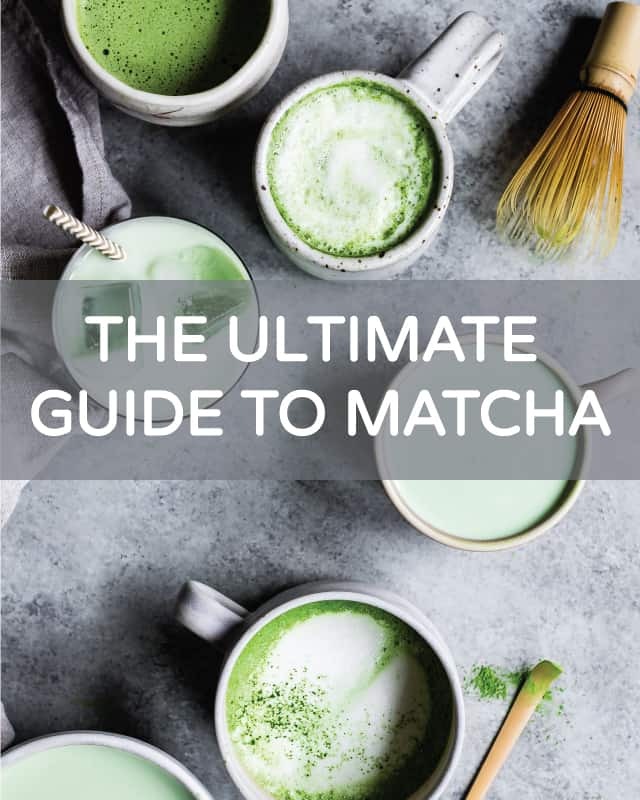 Soooo many, but I’d start by making Matcha w/ Blueberry Swirl. Thanks for the chance! This ice cream sounds absolutely fantastic, btw, and I love that it’s vegan. it’s not particularly unique but it’s my favorite and i can’t find it anywhere: cinnamon! The color of that ice cream is amazing! Thanks for the opportunity to enter your giveaway!! forgot to say I’d try this flavor first – thanks again! Sounds yummy, I might try making some fig ice cream, but not sure what to pair with it. I would make a cheesecake ice cream! One of my favorite things locally is a lavender ice cream in a lemon cookie sandwich. I think I’d try a lavender ice cream and do a swirl of homemade lemon curd in it for a lavender-lemon swirl ice cream! 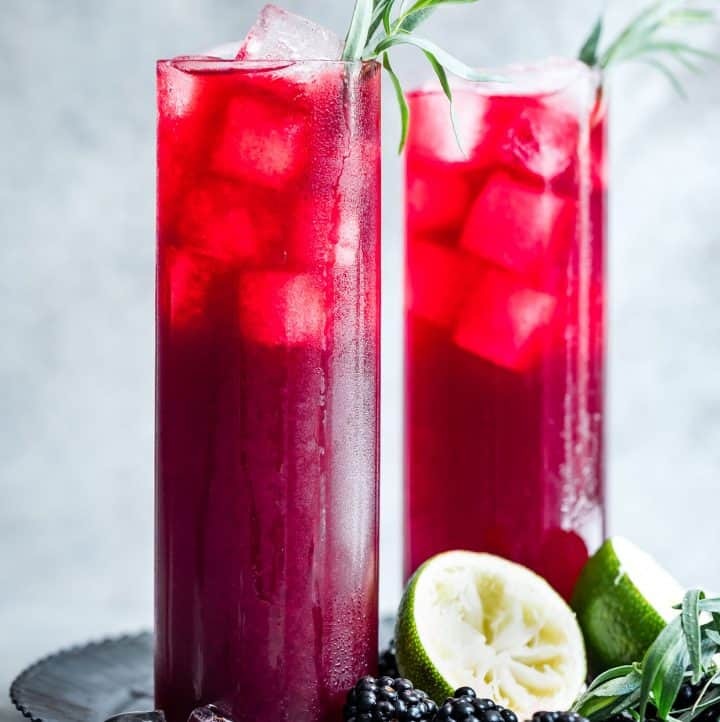 Great combo – blackberry & basil! I too have ice cream on the brain and recently got turned onto the coconut base vegan-style ice creams and I’m hooked. :) lovely pics..makes me want to jump right into a big bowl of it! Yum! Yum! Yum! If I come for a visit will you promise to serve me this delicious concoction? I was in ice cream heaven when you and your momma joined together to serve the delicious ice cream trio during your last visit! I dream of tasting banana-blueberry ice cream…Please-o-please will you make me some? Whoops! My name should be Aunt Lisa, not Ain’t Lisa—although sometimes I don’t feel like myself! Ha! I love this!! From now on I’m calling you Ain’t Lisa!!! This looks fabulous! Photos make me any it right now! 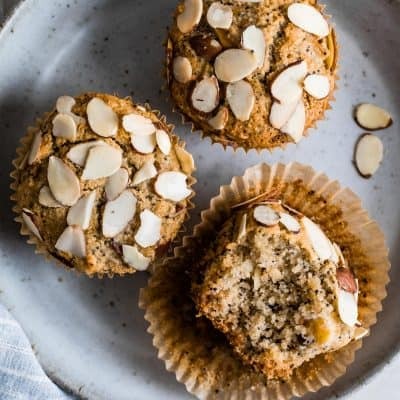 I love almond and chocolate – not too inventive but I would have to try it with coconut. On step 6. Put the Pour the puréed mixture into a large 1-gallon Ziploc bag. Seal it and submerge the mixture in the ice bath until cold, about 30 minutes. On step 7. Pour the blackberry ice cream base into the bowl of your pre-frozen ice cream maker. Follow the directions on your ice cream maker to churn the base into ice cream, until it is the consistency of soft-serve, about 18 minutes. On step 6, can I put the pureed mixture into the freezer for certain minutes instead? If it is possible, how many minutes will that be? On step 7, you let the mixture to churn until soft-serve, about 18 minutes. Why do you churn just till soft -serve? why don’t you churn longer till done? Pls advise. tks a million. Hi Anges, Thanks for your questions! I’ve never made a no-churn ice cream, but the reason you churn the ice cream is to get air bubbles into the mixture so it doesn’t freeze up rock solid with large frozen crystals. If you search “no-churn ice cream” you should find some helpful recommendations for churning it yourself without an ice cream maker! For step 7, the churning process is finished when it reaches soft-serve – this process imparts air bubbles into the ice cream while it freezes and making it so the large ice crystals don’t form. Then you “ripen” the ice cream in the freezer to freeze until more solid. If you kept churning in your ice cream maker, it wouldn’t actually get any more firm in the ice cream maker. Thanks again! Good luck making ice cream! I would make a black sesame seed and salted caramel ice cream or a basil apricot sorbet. Blackberry and basil is a GREAT combination! I will definitely be trying this ASAP! I NEED to make this Sarah! Looks so yummy and I”ve been wanting to try a coconut cream base ice cream. Love that coconut cream from TJ’s too. Thanks!! I’m wanting to try this coconut ice “cream” base. I can see so many different ways to use it. I have always wanted to make blue cheese and pear ice cream!! My ice cream would be just pure basil. I love basil ice cream! I had it one time at a culinary Institute and it’s never been the same! Obsessed with basil in ice cream. Topped with chocolate vinaigrette maybe!? I love blackberries, I’ll have to give it a try. Lavender and Vanilla – or a Lemongrass and Vanilla. Anything fun with vanilla! I’m all goo goo gaga over here with this beautiful ice cream maker and ahhhh totally forgot kitchenaid stand mixer can do that! I’m (in my mind) sitting all scrunched up in a corner wringing my hands just HOPING I can win this, hah! And it’s such a great feeling when your loved ones rave over your food, isn’t it? ANSWER TO YOUR QUESTION: I’d make….argentinean churro+dulce de leche filling flavored ice cream! Orrr….thai tea! Oh man, now you’ve got my brain working overtime. ;) Btw, have you tried argentinean churros? They’re so completely different from the Mexican kind but so good–kind of hard to describe actually! Filled with dulce de leche, thicker and crunchier on the outside, and much shorter in length. When I think of summer, one of the things I think of is ice cream so this is a perfect recipe!! I love this combination of flavors too and your pictures are amazing. I’m going to have to give this recipe a try!! I really want to make green tea ice cream, and chocolate-black-sesame ice cream. For some reason, I’m a little obsessed with Japanese flavors lately! I would make peanut butter, chocolate, and caramel ice cream. Umm….I want to be a part of your family! My family’s more into savory than sweet (I know #sad) so ice cream parties NEVER happen! Although my mom did make us homemade patbingsoo with all the works. It was good while it lasted..like 2 weeks. I’d love to make lavender honey! I would make raspberry & espresso chocolate chip – three of my favorite flavors! I would use the ice cream maker to make clotted cream ice cream! This is such an awesome giveaway! I would totally make a bourbon soaked cherry chocolate ice cream! Love love love this ice cream. So perfect for Summer! I totally would create a dark chocolate, walnut and halvah flavoured ice cream.. seriously can’t get enough of sweet Middle Eastern flavours at the moment. It’s a tie between chocolate lavender or a coffee ice cream. I’ve been let down with the coffee flavored vegan ice creams on the market, so I’m bound and determined to make it myself! Sarah, those pics are stunning, I just have to tell you. Gorgeous!! Something with strawberries and kale! I love the combo! Living in South Africa, I think my first try with making ice-cream would definitely be with Rooibos and vanilla flavours!! What gorgeous looking ice cream Sarah! I could eat this all.day.long. My mom has a Kitchenaid mixer and I love using it when I’m home with her! But I didn’t realize they could have ice cream maker attachments, I know what I’m getting my mom this Christmas!! Looks lovely! I have like 5 vegan ice cream I need to test very soon! It just haven’t been too hot around here :) Pinned! I’m OBSESSED with my KitchenAid and have been meaning to get the ice cream bowl attachment foooorevaaaaahs! 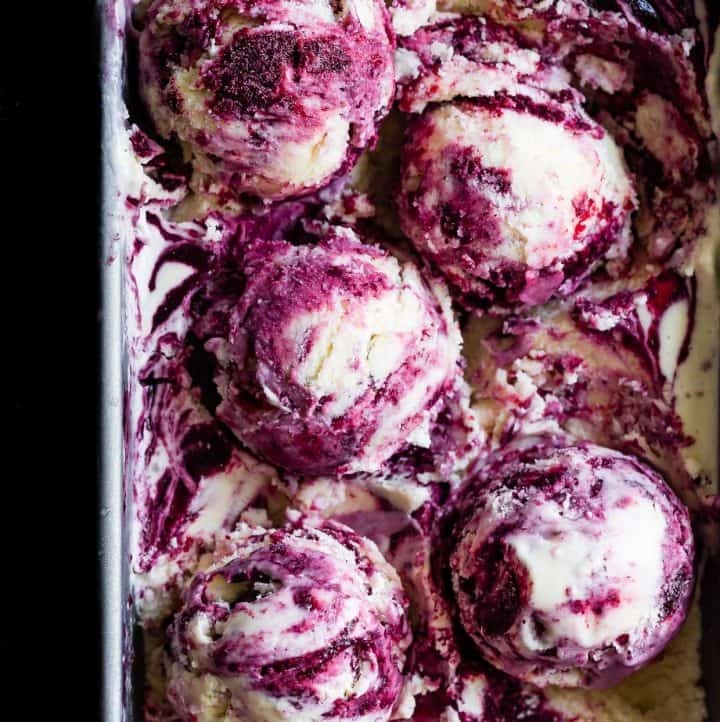 I’m in love with this idea of blackberry and basil together in an ice cream. I made basil ice cream ages ago and it was SO amazing! Must try this berry infused version, too! I would make a chocolate pistachio gelato! I’ve been looking into a roasted marshmallow ice cream to go on some graham cracker cookies for s’mores sammies : ) just in time for the fourth! hey Sarah!! I can’t wait to meet you next week here in Madison! ok, I love this ice cream. . love the flavor profile!! I once made a Blueberry, Lemon and Thyme Ice Cream. . this reminds me of that. . but better!! I would make that again or a strawberry balsamic or something like that .. !!! what a giveaway!!! WOW! This looks perfect! 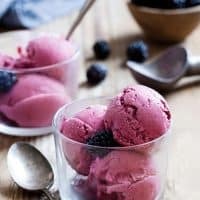 I loved blackberry ice cream as a kid because of the gorgeous color. My daughter Kelsey is on an experimental diary-free diet right now so this would be perfect! raspberry caramel would be my first choice! I mean, we both know that kitchen aid has my name written all over it, right?? ;-) I’m going to be baking with niece some time soon, and I feel like I’ll be doing the same thing—driving a million ingredients, bowls, measuring spoons, and the lot to my sister’s. Based on my tasting of your last ice cream, I’m sure this one is positively DELISH! Omg! I’m so excited to make the BlackBerry basil! I also saw a espresso chocolate chip that would be great! Thanks so much! 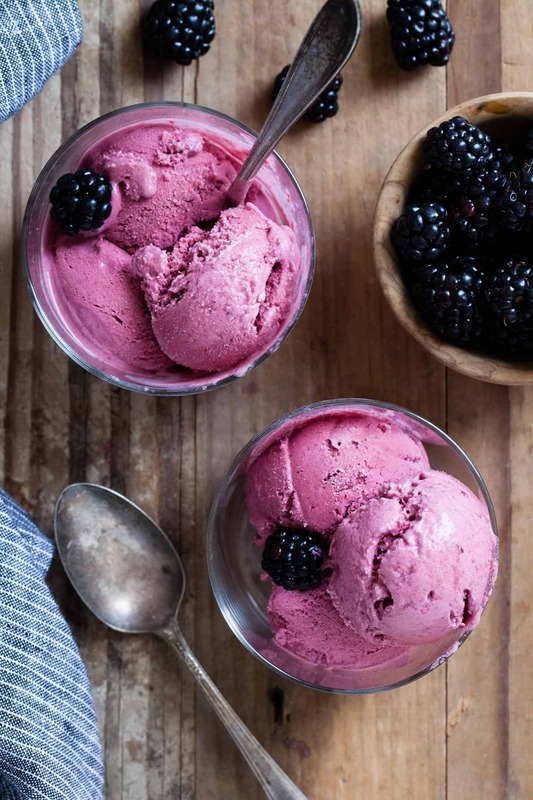 I would love to try this blackberry ice cream! I’d also like to try this with raspberries and strawberries! I like the blackberry one you have at the top and many others. I would make a yuzu ice cream! I’d make the blackberry basil! There are so many possibilities, but I would definitely try something with lavender or ginger! Yum!! 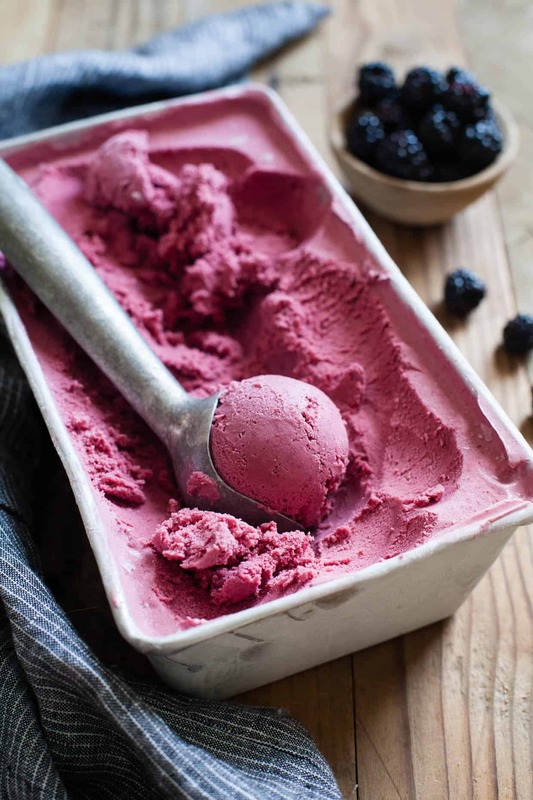 Of the list above, the Blackberry Lavender Chevre Ice Cream sounds right up my alley! I also had my eye on making a Chai Tea Spiced Ice Cream. My favorite has always been cake batter. I have been dying for an ice cream maker! Always enjoy vanilla, because you can embellish it so many ways! I will make cotton candy with salted pretzel ice cream. 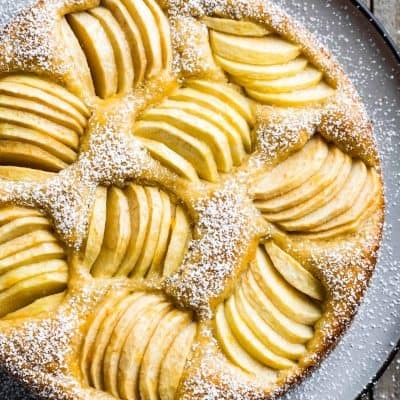 I’ve always wanted to make a apple pie ice cream. Vanilla fudge twirl. With lots of twirl! I have drooled over this attachment ever since I got my Kitchenaid. I would graciously give the mixer to my daughter who has yearned for one forever! LOVE, LOVE, LOVE my Kitchenaid! I would make a rich and satisfying chai tea and chocolate ice cream dessert. I love cherries. I have two cherry trees out back. My favorite would have to be cherry pie ice cream! I would make just plain ole vanilla, as that is a long time family favorite! Would totally love to try that! Been eyeing the ice cream attachment for some time but haven’t splurged yet! Love all of the flavor ideas & can’t wait to try them! I’m up for anything that’s out of the ordinary, especially if it involves chocolate! I think I’d start by trying some kind of fruity ice cream…maybe raspberry. I think I’d do a bacon doughnut flavor! The first flavor I’d make is s’mores. Chocolate ice cream and throw in some graham cracker pieces and roasted marshmallows. I want to try making cake batter ice cream! I would love to have a recipe for Blueberry Vanilla goat cheese ice cream OR pomegranate blueberry vanilla ice cream. How about a vanilla bean and bourbon glazed apricot ice cream! I just invented that? I must test it! I would make Dulce de Leche and Cookies ‘N Cream Ice cream. I would love this ice cream maker ty for the chance to win. I would try to make a sugar free ice cream, which seems hard to find in the stores! Maybe I would start with a coconut flavor that would naturally sweeten it. What a great attachment! 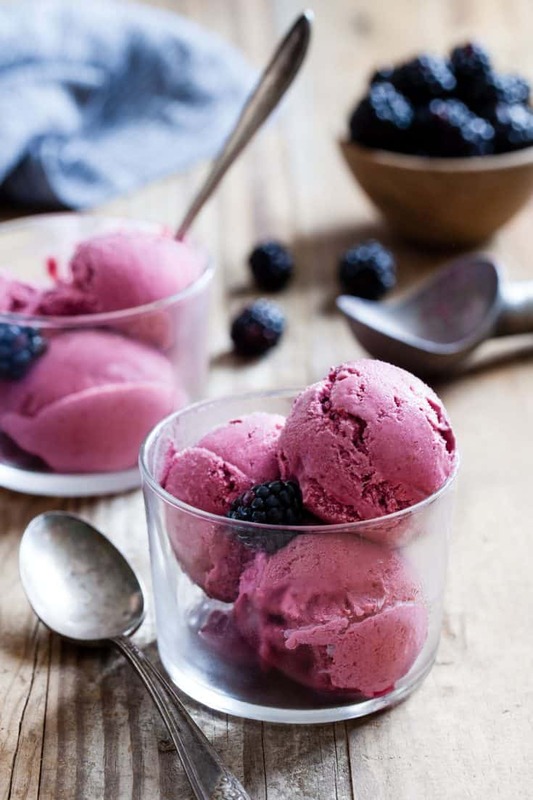 I’d love to try some berry ice creams! I would create a bacon and chocolate ice cream! OMG- I LOVE that your mom went to town on making a trio of ice cream flavors♡ so cute! And I totally feel you on schlepping a bunch of kitchen stuff over to the ‘rents house! So annoying but sometimes totally necessary! Anyways, I’m in LOVE with this ice cream! Love the flavors, love that it’s vegan and I LOVE that it’s sneaky (aka u can’t tell it’s vegan! Yess!) This is summertime perfection! Ive got to make this♡ Cheers, Sarah- hope u have a great 4th!! Definitely would need to try that Blueberry Cheesecake! Sounds amazing!! The flavor I would make first is peach. mmmmm. It sounds SO good! Since its the summer, I would try any flavor that reprsents summer from berries to watermelon with a twist of lemon/lime. Just bought an ice cream maker. 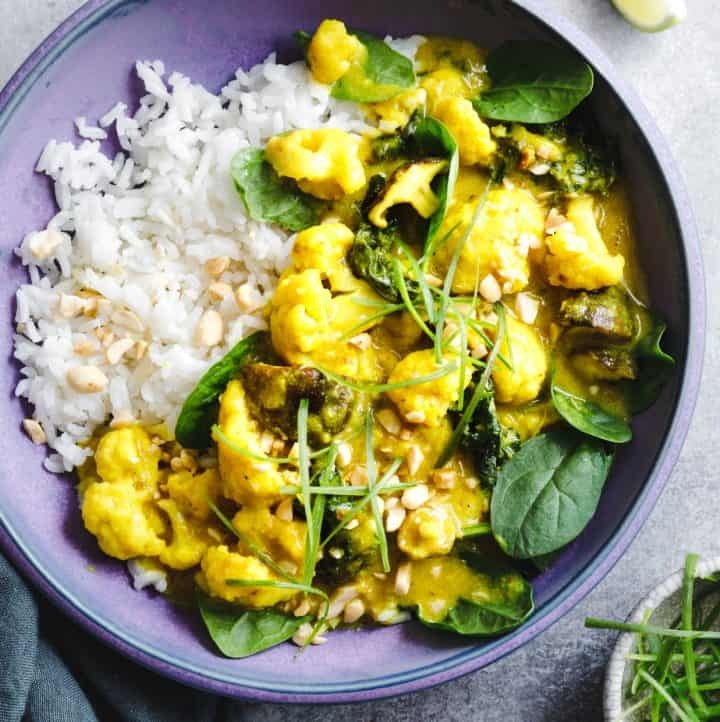 Trying dairy free recipes. I like that you said you can’t taste the coconut. That is what is throwing me off. I am tired of the coconut taste. Hhhhmmm. I think I’d make cherry / cranberry ice cream with a touch of vanilla bean. I love this vegan ice cream, but I also love cookie butter, so I would make a vegan cookie butter ice cream. How fun would it be to make this ice cream with a new machine! wow. Pretty incredible prize. Hope you will be sharing more recipes like this, too. Making ice cream would be a blast this summer, and we’ve had more strawberries than we’ve known what to do with in our house. So I’d probably switch it up a little and try a strawberry basil ice cream. Strawberry jalapeno would also be something I’d love to try! No dairy for me, so I’d try to make some with coconut milk. I would probably make chocolate ice cream first! I’d love to make a really creamy dairy free dark chocolate and red chile ice cream. My dad would love it! I once made a lemon basil cupcake that was delicious. I think it would be a great ice cream flavor combo! I love cheesecake, so I would definitely be trying some kind of fruit and cheesecake flavor! Thank you for the chance. I’d make jalapeno lime sorbet. I’ld definitely make lime/lemon basil sorbet! Great recipes! Thank you so much!!! Would love to try some of these fabulous recipes along with green tea and raspberry to compliment it : ) thanks for a wonderful opportunity. Would love to try some of these fabulous recipes along with green tea and raspberry to compliment it. I would love to try this machine for making icecream. Love icecream. The blackberry ice cream looks fabulous! Banana pecan would be my first attempt! Yumm! I’ve never see a vegan ice cream look so creamy and dreamy! Beautiful ice cream….I would love to make it, just need an ice cream maker! I would love to be able to make ice cream like this for my hubby and kiddos. It looks delicious! I absolutely love herbs in ice cream! I’d like to try to make pistachio! This ice cream looks amazing, I would definitely try it. 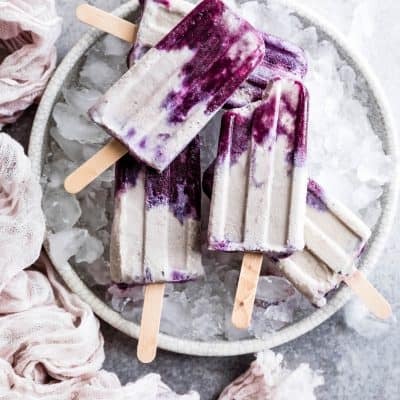 I also would love to make fig ice cream, honey lavender and any other flavor that works with coconut milk. My family is a family divided in their taste preferences. I think this recipe would be delicious to try, but for the rest of my family it would be lots of experimenting as many flavored as possibly. We would most likely do something with peaches first! That’s my husbands all time favorite and the kids would want something fun like cotton candy or just chocolate. Is it weird to say that ice cream is absolutely beautiful? I can’t wait to make it! Creole Cream Cheese is one of my favorite ice cream flavors. I love my kitchen aid appliances especially my double convection oven. Use it every day! I’ve dreamed of owning the ice cream maker! Having made ice cream in baking and pastry school I have wanted one even more. Always wanted to try making a Tiramisu ice cream, Ooooh excited just thinking about it. I would probably try to make an ice cream with pineapple or watermelon! Although I would love to try something with basil ! I’ve Never had that in my ice cream. My summer diet if I win. I love butter pecan ice cream so I would make a Carmel butter pecan ice cream! Yummy! Such an awesome post! Welk, being a Florida native I’d first try a keylime pie ice cream flavor! I just picked a bucket full of strawberries at a local farm. I think a chocolate covered strawberry ice cream would be a fun experiment! I can’t wait to try this! I am excited to try my first dairy free ice cream! I’m really into pb&j flavors currently so I think a peanut butter ice cream with strawberries. Yum! Now I have to pull out my clunky cuisinart! Having the KitchenAid attachment would be so much better! We would make pineapple blueberry almond mint or ginger lemon Thai basil or cocnut cherry chocolate chip? Ahh the options are endless! Excuse us we have some ice cream to make! Horcata & churro ice cream! I have never made ice cream before, however when I was in California about a year ago I had horcata (a cinnamon rice drink) and churro ice cream and I haven’t stopped thinking about it! I would like to make a strawberry/lemonade icecream with walnuts!! I love ice cream. I try every flavor then settle on my favorite vanilla. I’ve made homemade ice cream at home since I was tiny. First with my grandparents in a hand cranked, fill with ice and salt churn, then to an electric churn, to one that is placed in the freezer like the kitchen aid until as a big Christmas gift a self contained, has its own freezer system all you have to do is fill, put the dasher in and press a button ice cream maker. 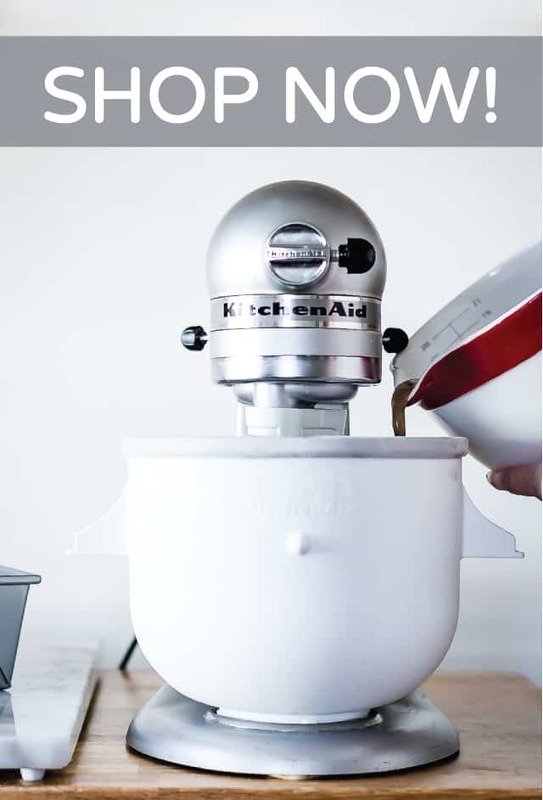 The Kitchen Aid system is lovely and one I’d love to try. I basically like anything mango, and I happen to have some mango puree in my fridge, so I’d likely do something with that. And probably berries if I could find some. Strawberry Mango would probably be the easiest. If I had the raspberries, though, I think I’d want to try a Raspberry Tarragon flavor combo. I think of it every time I use Tarragon, usually in savory dishes. Blackberry Levander yammmiieee!! Refreshing and tasteful! This ice cream is absolutely gorgeous, Sarah! And I’m jonesing for that KitchenAid ice cream attachment miracle. How cool is that?! Can’t wait to make. The color alone is enough to induce full summer swooning. The first flavor I would make would definitely be a vegan chocolate! Mmm! I’d love to make the apricot lavender recipe that you wrote up for your mom. It sounds heavenly! We used to make our own ice cream when we were kids and rum-raisin was my favorite. :) Ours was a device similar to the kitchenaid tub, but we had to take turns rotating a handle haha. The blackberry basil ice cream looks awesome. I would make bacyard mint cantaloupe ice cream to cool.off on this hot, Hawaiian summer day! I would make backyard mint cantaloupe ice cream to cool.off on this hot, Hawaiian summer day! My childhood fave black raspberry would be my first endeavor! I’d probably start with basic chocolate and get more adventerous after that, like lemon and ginger or lemongrass, ginger and thai basil! Peppermint ice cream, hands down. I would make a ginger ale ice cream w/ choppedmint leaves, fresh lime juice, & lime zest. I would totally make the roasted balsamic strawberry ice cream! That sounds amazing! I’d make chocolate & hazelnut ice creams . I cannot wait to make all of these recipes listed! The first will be the blackberry and basil! I would love to make a blueberry & strawberry ice cream! Or maybe a blackberry lime……yum yum! I would love to make this ice cream for my daughter who eats vegan so she can enjoy ice cream again. I would like a strawberry and blueberry ice cream. I would like to try the blackberry basil ….odd combination but two flavors I love! I’d also have to make some old fashioned vanilla with lots of pecans! I think I’d make blackberry coconut! I would make a pistachio, cardamom, and rose petal ice cream. I am currently obsessed with Middle Eastern and Persian spices! I would make a cardamon alphonso mango icecream. What a wonderful way to celebrate the summer! I might try Peanut Butter and Banana Ice Cream! I would make a vanilla & miso ice cream! I am making your blueberry basil as I type this! I love Coconut Cake Ice Cream. Basically, you make coconut flavored ice cream & add bits of crumbled coconut cake. Yum! I would make banana with chocolate pieces. Maple Bacon would be awesome! I would first try a coconut infused flan flavor. Love me some caramel!! I would make some kind of white chocolate raspberry ice cream. What a nice, summery giveaway! Duuuuude this is freaking gorgeous Sarah!!!!!!! Seriously, amazing. I love blackberry and basil together, I would make this!! Thank you for what looks to be a delicious recipe! Though not unique, I’ve been wanting to try some combination with Lavender (probably Lemon). I’d make a rose and pistachio flavored ice cream! Anything with mint and chocolate!! Your Blackberry Basil sounds amazing! The fruit is so beautiful this time of year, Yummy!! I would also try a nut cacao combination! Love the vegan choices. Yum! Those blackberries sure look delish!!! I’ve been wanting to make a raspberry white chocolate ice cream. 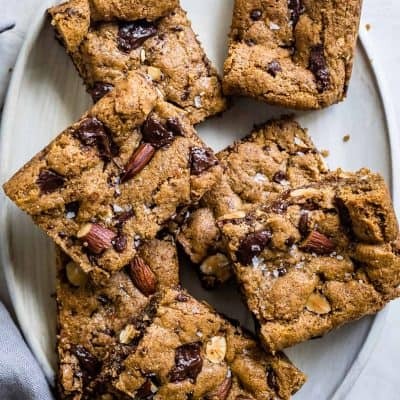 A brownie coconut sounds right up my alley! I’m super into lemon balm, scented geraniums, and elderflowers right now…so I’d want to mix up some herb & flower concoctions! Yum.